Sometimes outer London isn't especially interesting, unless you happen to actually live there. This Greggs near the Lea Valley reservoirs was boarded up a few years back. Its decaying signage lingers as a reminder of corporate branding long abandoned. A pet shop in the same parade closed in 2012 citing parking restrictions as the last straw. A McDonalds trades across the street in a former pub. The nearest sausage and bean melt can now be found less than a mile away on Station Road. Planned redevelopment by Waltham Forest Council is expected to include 19 residential units, a Co-operative food store and a Costa Coffee. Do you live along the Sewardstone Road? Can you tell us more? 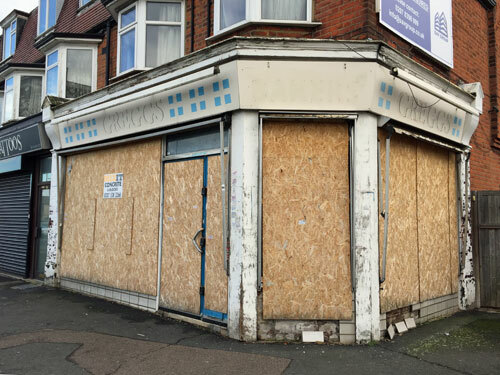 Greg says: Sewardstone Road extends out towards Waltham Abbey & is a curious mix of decaying shops, closing pubs & re-opening pubs, & spots of regeneration & new businesses. James says: Many years ago there was a dodgy chippy on that stretch of Sewardstone Road that was regularly busted by the local health department for selling tainted white fish and pretending it was cod. This mini roundabout sits at the five-way junction on the A220. Two centuries ago this was a meeting point of tracks across the heath, until the railway arrived and extensive housebuilding intruded. 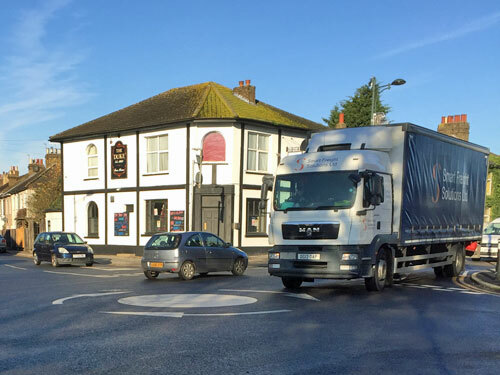 Lorries generally cross the central painted circle rather than steering round it. The pub on the north side is The Duke, formerly the Duke of Northumberland, and opened in 1863. Its bar is presented in a traditional manner with stripped wood flooring, dartboard and pool area. Regular live music, quiz nights and karaoke are part of the entertainment offer. Do you live in Northumberland Heath? Can you tell us more? Nick says: There is a big bakery plant here, and the remnant of the Heath (known by that name since the C13th) is a large green space called Bursted Woods. Kathryn says: The cemetery has the memorial to the Slade Green munitions disaster by the entrance. The nearby Erith Hospital has a grade II listed underground hospital, built during WW2 and now an X-Ray Department. Hanwell Town FC have played their home games in Perivale since 1981, at Reynolds Field adjoining the A40 Western Avenue. Stalwarts of the Evo-Stik League South East, Ray Duffy's team once reached the third qualifying round of the FA Cup. Their Powerday Stadium is sponsored by a local waste management & skip hire company and has a maximum capacity of 3000. Yesterday 97 spectators turned up to watch the home team throw away a two goal half time lead against Chalfont St Peter, eventually losing 3-2, with Ryan Haugh scoring the late winner. 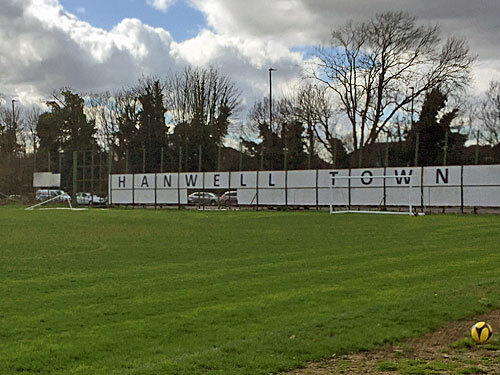 Do you support Hanwell Town? Can you tell us more? 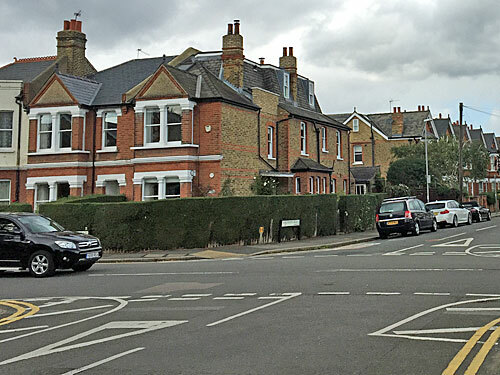 The smartly-hedged streets of Canbury ward, to the north of Kingston town centre, are a hotbed of community. Burton Road's street party to honour 2011's Royal Wedding was so well organised that ITV came to film the preparations. At the junction with Kings Road hatched lines have been painted on the road surface as an accident reduction measure. Across the street is the headquarters of 'one-stop-building-shop' D.M. Spragg Ltd, established in 1957 by Donald & Beryl Spragg. St Luke's Church has close ties to the Diocese of South Australia. Do you live in Canbury? Can you tell us more? GJ says: There is a Park Road in Canbury that rather confusingly doesn't lead to nearby Richmond Park. GJ says: During the First World War, Canbury was the home to Sopwith, the aircraft makers, who tested floatplanes on the nearby Thames. Timbo says: Until 1988 Kingstonian football club's stadium used to be at the north end of Burton Road - now, like the Sopwith factory, given over to modern housing. Timbo says: Kings Road used to have a parade of shops, from newsagents to DIY to greengrocers to glaziers. Most have also been converted to domestic use - Spraggs is one of the last survivors. Timbo says: Canbury Ward also has a "lost" river (the Latchmere Stream, which follows Acre Road, cutting the corner between Burton Road and Kings Road) and occasionally floods. Timbo says: Kings Road saw London's very last trolleybuses in 1962. Timbo says: The Burton Road street parties have been a regular thing since they were revived for the Golden Jubilee in 2002 (one of my neighbours, now sadly passed away, even remembered the previous one, on VE Day). Timbo says: The "smart hedges" to which you refer made the local news a few years ago, when the council took an agricultural-type flayer to some of them, making them very-definitely-not smart! John says: Some of the old aircraft buildings in Canbury Park Road still exist and are now in use as dance studios for the BalletBoyz dance company. John says: The large listed Regal cinema building at one end of Canbury Park Road is being converted into flats and a restaurant including a conference centre in the old circle space. Ned says: In the 1940s, London Transport intended to build a bus garage in what was known as the Canbury Clearance Area - this was a triangular site bounded by Richmond Road, Canbury Place and Canbury Passage. The plan was dropped in 1952.